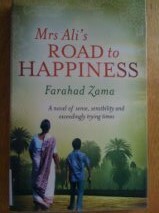 Mrs Ali’s Road to Happiness by Farahad Zama is a gorgeous novel, full of delightful characters who made me laugh again and again throughout the events that made up this story. I haven’t read the other books in this series, (I believe this book is the fourth) but that didn’t matter at all. This novel was able to stand alone. The story centres around the household of Mrs Ali, a woman with a recently retired husband and a grown up son. Mrs Ali is a wonderful manager, who encouraged her husband to open a Marriage Bureau for Rich People, which he runs from the veranda of their home (the main purpose of the business is to keep Mr Ali from getting under his wife’s feet, a complaint my mother makes constantly about my father since his retirement from work). Mr and Mrs Ali live in Vizag, a town with Muslim and Hindu families. The Ali family are Muslim and when Mrs Ali’s niece Pari, adopts a Hindu orphan, Vasu, both the Hindus and the Muslims are up in arms. The Imam and members of the Ali’s mosque want Vasu to convert to Islam, while the Hindus are adamant that Vasu be brought up as a Hindu, which Pari had already committed to. The religious differences leave the Ali family on the brink of being excommunicated from some of their family, their mosque and community. Other household problems include the power being disconnected because of an electricity meter reader who recognises that the household should be on a commercial meter because of the family business, a road widening project threatening their home and arguments about when Ramzaan (Ramadan) starts and ends. The cover of this novel has the words, “A novel of sense, sensibility and exceedingly trying times,” which is clearly a nod to Jane Austen. Mrs Ali has both sense and sensibility, and deals with her trying times admirably. On one occasion, Mrs Ali took a taxi to visit her family and made the observation that the driver appeared “to regard anyone overtaking him as an insult to his manhood.” This made me snort with laughter, as I have noticed this trait in various male drivers in my own family. Another character bought a microwave for her family, in order that they could impress their friends and neighbours. The family only had one power point, so the television was unplugged in order that the microwave could be tested and admired. Water was heated up, to everyone’s astonishment, but then two eggs were placed into the microwave…resulting in egg on someone’s face, literally. Reading this, I howled with laughter. Mrs Ali’s good sense also extends to advising a new groom to give flowers to his bride and to take her out sometimes on their own, despite his father having told him not to spoil women, else they “climb on your shoulders and dominate you.” Mrs Ali tells the groom that in the early days of his marriage he should be depositing happy memories so that when trying times come the couple will have a bank of shared emotions to draw upon. In my opinion, all engaged and newly married couples should be given this good advice. I am so glad I picked this book up. As I said earlier, Mrs Ali’s Road to Happiness was an absolute delight.